If you're a mechanical keyboard aficionado then the Roccat Horde Aimo is almost certainly not for you. Its hybrid "membranical" keys, despite being very comfortable and quiet to type and game on, just don't quite match up to the snappy and precise performance delivered by keyboard equipped with high-quality mechanical switches. 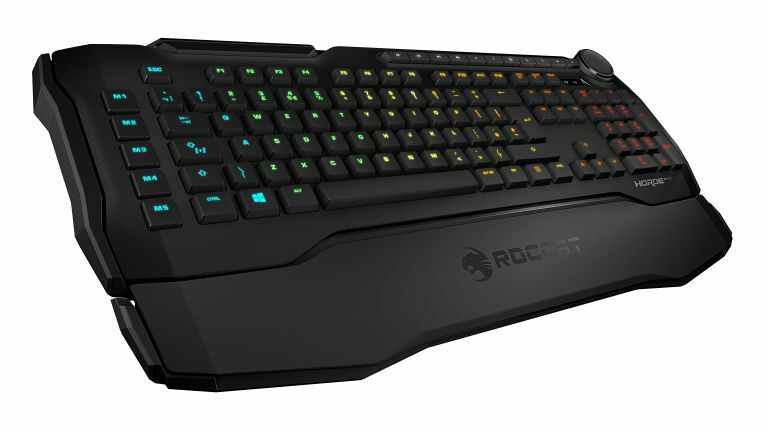 However, for membrane keyboard fans shopping at the premium end of the market, or those looking for good all-round gaming package, the Roccat Horde Aimo is definitely worth considering. I'm going to be honest - I love mechanical gaming keyboards and, given a choice, I have typically plumped for them over membrane keyboards in the past. Which is why I was very keen to take a look at Roccat's new membrane-mechanical hybrid gaming keyboard, the Horde Aimo. Advertised as offering the best of both worlds, with the precise, linear distinction of mechanical switches, and also the quiet, light smoothness of a membrane unit, the Horde Aimo promises a system that sits in a sweet spot between the two types, while also delivering a suite of other popular gaming keyboard features, too. Which, for an RRP of £89.99, is certainly an interesting financial proposition. Top calibre mechanical keyboards with reprogrammable keys, RGB lighting, macros, and customisation software start around the £100 mark, so the Roccat Horde Aimo delivers a comparative package with membranical keys instead of pure mechanical keys for a similar price point. The obvious question to ask therefore is: which keyboard type is better, membranical or mechanical. The answer, as we shall see, while technically definite, certainly isn't so in terms of a recommendation for every gamer. The Roccat Horde Aimo costs £89.99 and is available now directly from Roccat, as well as online retailers such as Amazon. If you already have a Roccat device, however, then you can enter its 16-digit serial number to sign up as a "Roccateer" and save 10 per cent on purchases from the maker's online shop, allowing you to pick up the Horde Aimo for £80.99. First thing you notice when you take the Roccat Horde Aimo out of the box is that it has a design that feels old-fashioned by today's standards. That's not to say it is bad, but with its low profile, off 90-degree angles, and simple black finish it recalls the days of boards like the Razer Tarantula. The next thing you notice is that, with its attachable wrist rest (which simply slots in and out of two covered recesses at the front of the keyboard), it has a huge footprint on the desk. Even with the rest detached, it is still large, and is reminiscent of a hot hatch's spoiler in terms of shape, something exaggerated by - in comparison to a pure mechanical keyboard - its low profile. The low profile extends to the membranical keys, too, which sit with a matte black finish in a super wide and rather deep spacing. A row of five super flat, quick-fire macro keys line the left hand edge of the board, while a pretty comprehensive set of shortcut keys line the top edge and terminate in the top right corner in the Horde's tuning wheel (more on this later). Other than that, though, the design of the Horde is rather understated, which I very much approve of. It isn't particularly heavy, either, with it feeling slightly less sturdy in the hand than I would like, however, when on the desk it feels rock solid and doesn't suffer from slippage. As seems to be very much on-trend now in gaming keyboards, the Horde Aimo doesn't feature any auxiliary ports. This keeps its design slightly cleaner but I honestly prefer to have some sort of connectivity options on our boards, even if that is a single USB port. The aforementioned scroll wheel located at the top right of the board rotates with a smooth series of muffled, tactile clicks, and allows you to quickly control many aspects of the Horde Aimo, such as lighting intensity and FX types, as well as general aspects of your system, too, such as volume and program switching. The big sell for the Horde Aimo, its "membranical" hybrid keys, feel 70 per cent membrane and 30 per cent mechanical under the fingertips. The keys are low-profile and quiet, sport mid-way actuation, and deliver a tidy typing sensation. There's definitely still some of that membrane sponginess in their action, especially when bottoming out, but I suffered zero adaptation issues, quickly and easily hitting our regular typing speed and accuracy. Playing games like Deus Ex: Mankind Divided, Wolfenstein II: The New Colossus, and Final Fantasy XV was also just as good an experience with the Horde Aimo than recent mechanical keyboards I've used - I simply forgot I was using it - and I noticed no dropped inputs, even when the action got very intense. We're guessing that if you are pro-level esports gamer switching to Horde Aimo for online competitive action then you might experience more of a transition, however, I could not say the membranical keys made us any better or any worse in-game from a skill point of view. The Horde Aimo is powered by Roccat's Swarm control software (see above), which allows you to tweak, program and customise all aspects of the keyboard. This is a seriously comprehensive and impressive piece of software, allowing the user to alter everything from typing options like repeat rate and delay, as well as cursor blink rate and typing sound effects, to key assignments, game and user profiles, key illumination modes, intensity and speed, and also macro pre-sets and customisation among other things. Swarm also lets you activate the Horde's Aimo Intelligent Lighting System. This is Roccat's shot at a "learning lighting experience", with the user's peripherals (which sync) adapting their lighting mode, colour and intensity according to the owners needs at any one time. As such, when Aimo is activated, how each peripheral is lit varies dependent whether the user is idle, typing, or in the middle of an intense gaming session. And, talking of lighting, while the Horde Aimo features a bevy of modes and colours to choose from, I have to say I was unimpressed with the keyboard's intensity range. While using the keyboard at night or in a darkened room key illumination is bright enough, in daylight you struggle to see anything at all, which at first made us even think the board was defective. I'm guessing this weak daylight performance isn't going to bother too many gamers, however, if you demand a level of all-day visible pimp from your board then the Horde Aimo is going to disappoint. By the end of our testing period with the Roccat Horde Aimo, despite our penchant for high-class mechanical gaming keyboards, it had gone a long way to win us over. It feels old-school in a reassuringly familiar way, and its soft, quiet and very well-spaced membranical keys delivered an interestingly quasi-alien typing experience. Yes, the Horde Aimo does not deliver the same mechanical keyboard experience that you'll get with a dedicated unit, however, Roccat delivers the full package here, ticking almost all the boxes I look for in a gaming keyboard. I would have liked some auxiliary ports, sure, a slightly more premium weight, and a much brighter lighting intensity, however, overall there was little else I could mark the Aimo down for. Which brings us back to the question of if the Aimo's membranical keys are better than mechanical switched keys. The answer is technically no, but in terms of everyday usage for PC gamers, then I feel it simply all comes down to individual preference. If you like high-profile, super definite key stokes with a solid click-clack audible return, then look to a pure mechanical board, but if you prefer a smoother, low-profile and quieter typing experience, then Roccat's new membranical system is 100 per cent worth taking a look at, as it definitely delivers a fully equipped gaming package. More information about the Horde Aimo can be found on Roccat's official website.